Select the fields to display in detail page. Choose the fields to display in detail page - Click field and click in On/Off to select (or unselect) fields. Beside the Grid - Display detail at the right side of the record, in the same window that displays the grid. Below the Grid - Display selected record detail, below the record at same window (use the detail button to select the record detail). In another page - Display just the detail for the selected record hiding the grid. In another window - Display detail in popup window. Alignment - Define detail alignment configuration of each field (left, right, center). Detail's page width - Define the grid detail page HTML width. Measure unit of the detail - Define grid detail page HTML width unit as percent or pixel. Define the fields that will be a part of the where clause to search selected record. Turn On/Off - Select field to display in the detail. 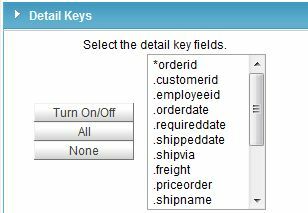 An asterisk is displayed by the selected field . All - Select all fields. None - Uncheck all fields.